Imagine that we could change all the mosquitoes in the world so that they would no longer take a blood meal, and then consider the impact on transmission of viruses and parasites. Before you say impossible, you should know that Nature has already done it – not all mosquitoes take blood meals. There are three known genera of mosquitoes which do not bite, and a few species in other genera. 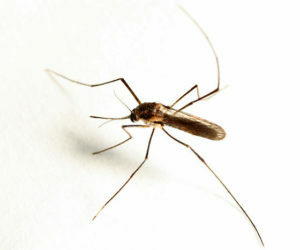 The pitcher plant mosquito Wyeomyia smithii (pictured – image credit) is the only one that has both biters and non-biters in different parts of the world. It is thought that the non-biting populations in the northern hemisphere evolved from the biters in the south. Despite the different behavior, these mosquitoes can interbreed. The availability of interbreeding biting and non-biting mosquitoes of the same species makes it possible to determine the genes involved in taking a blood meal. To achieve this goal, thousands of non-biting Wyeomyia smithii were captured and selected for seven generations for the ability to bite. This selection was done by placing the mosquitoes in a cage with a rat. Those mosquitoes which inserted their proboscis into the rat skin – but did not draw blood – were taken and bred, and the offspring were again subjected to the same selection for biting. The transcriptome – all the mRNAs – of biting and non-biting mosquitoes were then determined by sequence analysis and compared. Genes of seven metabolic pathways were identified that differed among the two groups of mosquitoes. The results suggest that consuming blood comes with a metabolic cost, as these mosquitoes up-regulate genes involved in protein degradation, cell cycle activity (e.g. nucleotide synthesis) and ovarian maturation. These mosquitoes also showed reduced light sensitivity and increased odorant receptivity. Amazingly, all these changes occur before any blood is consumed, but as the mosquito anticipates a blood meal. Non-biters, on the other hand, had increased light photoreception and reduced odorant sensitivity. Furthermore, the metabolic genes that were elevated in these mosquitoes demonstrate the flexibility to proceed through diverse metabolic pathways depending on need. In other words, the evolution of a biting to a nonbiting mosquito is accompanied by reduction in expression of genes anticipated to be needed for digesting and using a blood meal, and up-regulation of genes involved in an opportunistic lifestyle. This study has identified numerous genes whose transcriptional activity differs in biting versus non-biting mosquitoes. The next step is to determine if such clusters of genes are under the control of one or a few genes encoding regulatory proteins or RNAs. I can imagine creating genetically altered mosquitoes of important disease vectors (Aedes, Culex, Anopheles) that are non-biters, and releasing these with the intention of having them replace natural populations. Alternatively, a spray might be developed for topical skin use which would reprogram any mosquito that approached and turn it into a non-biter. What would this spray be called – BiteSwitch? BiteOff? BiteNoMore?